Backyard kitchens are an amazing addition to any home. This Humble patio kitchen is an amazing testament to that. Made of all stone, this outdoor kitchen really fits in with the natural landscape that surrounds it. While the kitchen is made to look natural, all brand new stainless steel appliances were installed to make this kitchen efficient and eye appealing. As you can see, this Humble patio kitchen is quite intricate in design. Some companies will cut corners with complicated projects, but not us. Here at Outdoor Houston Kitchen Pros, we build all of our patio kitchens with complete quality, in both materials and the construction of the kitchen. We do not cut corners! 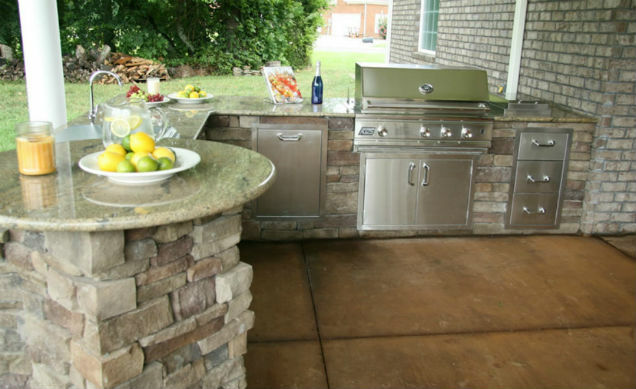 You will be 100% satisfied with your patio kitchen, we guarantee it. You too can have a exquisite backyard kitchen today! Contact us for a free consultation and get your dream kitchen started!